The auditorium for this international investment firm represented a "project within a project" for the Thorpes team. The main project was comprised of four consecutive phases, with the auditorium joinery representing phase one of this process, meaning that the programme to deliver this complex grouping of specialist joinery products and finishes was highly-demanding and critical to the smooth progression of phases 2-4. Due to the large amount of high-spec AV and services throughout this area our team devised a split package to accommodate this and ensure minimal disruption. 'Package 1' encompassed the tiered flooring and desk framing, with 'Package 2' containing the architectural finishes. With this in mind, all of our specialist joinery was designed to be delivered in easily assembled modules, and this coordinated approach allowed for us to deliver an extremely high quality joinery and finishes package, whilst catering for services and AV sub-contractors. 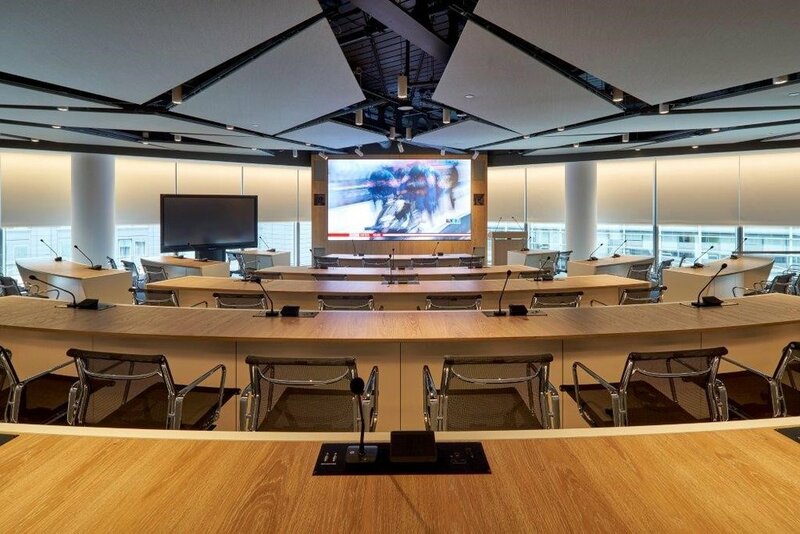 The end result is visually impressive without compromising on functionality, with European Oak veneer on the desks and AV wall nicely complimenting the crisp white laminate to the tables.